Here at Deep Grass Graziers, we are breeding cattle to thrive in our southern climate and produce calves that will fatten on high quality forages expediently. To do this, we searched far and wide to source seedstock from producers who had preserved pure, old-line genetics of cattle that thrive in minimal input programs. In New Zealand we found what we were looking for. Pinebank Angus has had a scientifically designed breeding plan for the past 50 years, ruthlessly culling animals that don't thrive and breed back under any and all conditions. It is a forage-only program that stresses fertility, structural correctness, efficiency, and gain. In partnership with the Falloon's at Pinebank Angus, we have created Pineband Southeast, which has been established through Embryo Transfer of their genetics into our recept cows. We have also had success using Wye Angus genetics sourced from Ed Oliver of Oliver Family Angus. 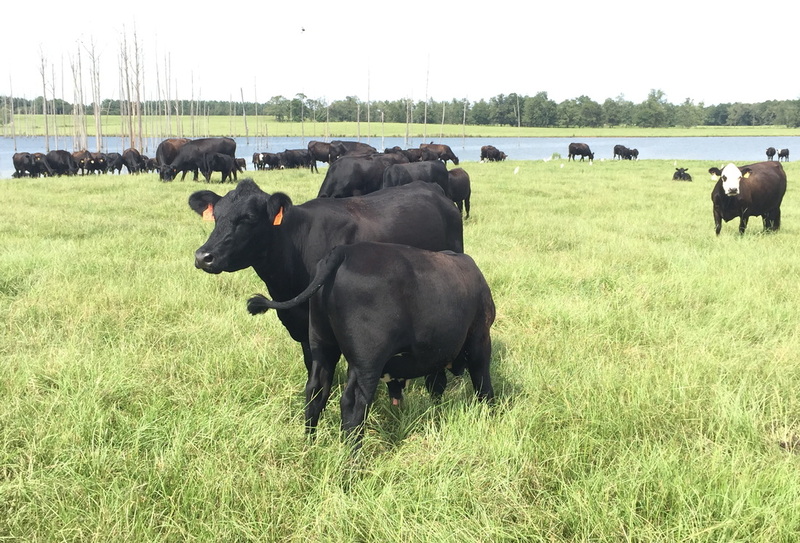 Ed has utilized the very best of the Wye herd and line bred them tightly, to create some of the most pre-potent, maternally focused cattle in the southeast. Today, Ed's son Spencer continues the breeding progress of his father. We've also purchased bulls and heifers from Kinloch Farm, in Virginia. The herd manager, Kevin Jennings, has done his homework piecing together some of the best genetics from great grass herds the world over. Kevin's wife, Dawn, and their three kids all know the herd inside and out, and make a great management team of excellent cattle. In 2013, we acquired an outstanding small herd of cattle from Bill and Di Hodge of Hodge Ranch. Bill has been a mentor to me and our friendship has led to our partnership in his business, Sustainable Genetics. Bill used forty years of experience studying cattle herds to blend Pinebank, Wye, old-line Graham, Shoshone, and Rito bloodlines to create a genetically pure angus cow with maximum reproductive longevity. They have been bred to excel on southern grass, and they produce calves that do the same. A few years back we also had the pleasure of meeting the Jones family at Red Hill Red Angus. Red Hill has continued the success of Beckton and Buffalo Creek breeding programs, creating an efficient herd of red cattle that have been selected to perform on fescue and the heat of the south. At Red Hill, we acquired our herd sire, RHF-BUF U199 Lancer 157y. We've used him successfully on small frame heifers and the calves grow like pigweeds. Our best son of 157y, DGG 523b, catches the eye of all of our visitors. We have also had the fortune of sourcing calves from Woodstone Angus. Bill Woods has used pure, old-line Aberdeen Angus genetics to outperform 'Performance cattle' in the feedlot. These cattle not only grade exceptionally well on feed, but do what the 'Performance cattle' cannot - grade exceptionally well on grass. A high percentage of our first Woodstone Angus steers developed on forage graded Choice and Prime (and were delicious!). One of our breeding goals is to produce cows that 'fit' our environment. By culling animals that are not bred in a 45 day breeding window, and never supplementing our cows with off farm inputs, we make them work for us. One measure of success is what percentage of a dam's weight can she wean each year. Our goal is for our herd average to be above 50% each year, without off farm inputs. We don't cull animals that don't wean that much, but records are kept to ensure we know who our most profitable cows are. The heifer pictured below is off to a very good start. She weaned 72% of her bodyweight and bred back on time!